Fearless skateboard goes down a hill and manages to set off a speed camera. Submitted by monkey on Tue, 02/05/2013 - 3:45am. Awesome kid that can drink a bottle of water in a second goes on Ellen to show off and wins $10,000 for college! Submitted by monkey on Thu, 01/31/2013 - 3:43am. 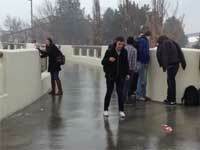 Slippery pedestrian bridge in Utah looks like a lot of fun. Submitted by monkey on Thu, 01/31/2013 - 3:29am. 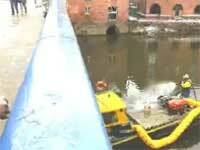 Don't bring a snowball to a water cannon fight. Submitted by monkey on Mon, 01/28/2013 - 1:16am. 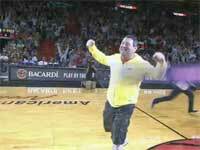 This will put a smile on your face, Lebron James hugs and tackles a happy guy that just won $75,000. Submitted by monkey on Mon, 01/28/2013 - 1:04am. 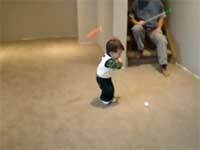 Cute video of a 17 month old boy hitting golf balls like a pro. Submitted by monkey on Thu, 01/24/2013 - 2:56am. Seven year old with cerebral palsy does triathlons together with the help of his older brother. Submitted by monkey on Tue, 01/22/2013 - 2:44am. Crazy guy climbs a building and then does a huge gap jump. Submitted by monkey on Tue, 01/22/2013 - 2:31am. 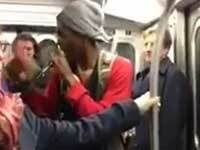 Amazing guy in the NYC subway is both a beatboxer and comedian. Submitted by monkey on Thu, 01/17/2013 - 2:27am. Girls beach workout video goes wrong. Submitted by monkey on Thu, 01/17/2013 - 2:22am.